Things are less than tranquil between Prince William and Prince Charles after crazy Camilla Parker-Bowles decided to pay Kate Middleton a little visit. Camilla took advantage of William’s absence to drop in on Kate at home for an impromptu tea party. 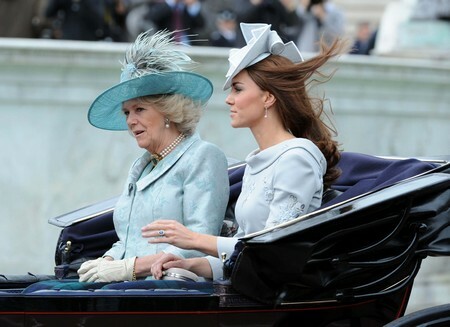 But Camilla’s reason for dropping by was to try to humiliate The Duchess of Cambridge. Sources say Camilla’s been acting particularly obnoxious since Queen Elizabeth II announced the new royal pecking order, which decrees that Kate must curtsy to Camilla (and certain other senior royals) in public whenever William is not around. The background to the fight between Charles and William requires some elucidation. It seems that Prince William has been understandably bitter ever since Queen Elizabeth II decided to allow The Prince of Wales to succeed her on the throne, passing over Charles’ much more popular and respectable son. William’s friends said he was “stabbed in the back” by his own father who persuaded the 86-year-old monarch that his eldest son and 30-year-old Kate were “too immature” to shoulder the burden of the British Crown. But there is a catch! Elizabeth’s deal with Charles to allow him to become King only holds if he can keep his marriage to Camilla together. Charles already divorced William’s mother, Princess Diana, amidst terrible scandal – Charles was cheating on Diana with Camilla and everyone knew it! Another divorce would be unthinkable and would permanently destroy Charles’ chance to be King. After all, these are not the times of Henry the Eighth. So Charles needs to keep crazy Camilla happy – and reportedly she is a handful! William’s comments only enraged Charles, who is desperately trying to appease Camilla so she doesn’t go off the rails (again) and destroy his chance of becoming king. What does Charles care if Camilla wants to make Kate curtsy? The conversation between father and son got even uglier – and all the gory details, including those of what transpired at the tea party, are available in this week’s GLOBE. Which couple do you prefer as the future King and Queen Consort – Charles and Camilla or Will and Kate? Which pair would do a better job? Let us know what you think in the comments below.